Ride Minnesota, 23 Great Motorcycle Rides in the North Star State is the culmination of two summers’ worth of motorcycling in Minnesota. 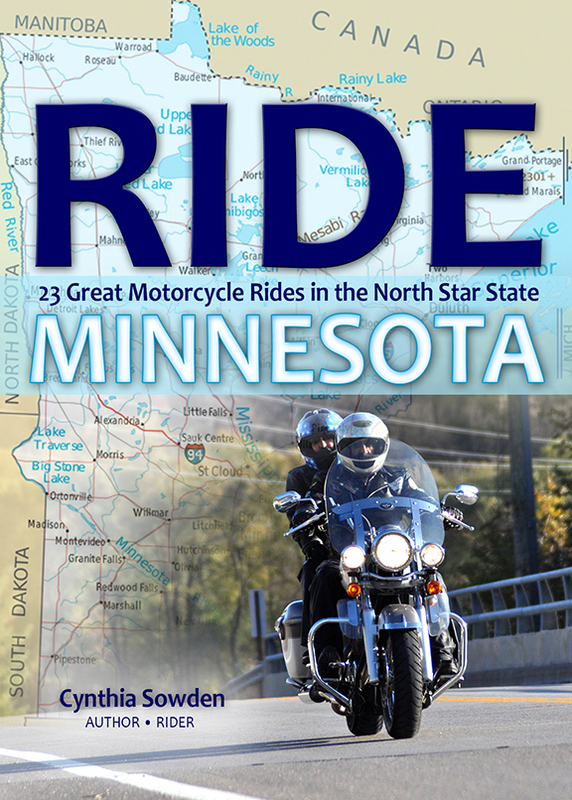 Ride Minnesota is a motorcyclist’s guide to some of the most beautiful and exciting rides in the North Star State. The author and her husband rode every mile of each of the 23 motorcycle routes described in the book. They circumnavigated the state and set foot in all four corners. The book includes maps, photos and recommendations for hotels and restaurants. The cover photo was taken by Lisa Olson of Fat Cat Art Studio in Inver Grove Heights. Ralph and I rode back and forth on County 7 Blvd. near Welch, Minnesota, while Lisa worked the angles and took the shots. The cover looks great. Makes me want to hop on my bike right now even if the temp. is only 5. Can not wait to buy a copy and plan my next trip to MN. Ordering a copy today. Spent my formative summers growing up at a wide spot in the road called Clements, MN, with my grandparents. Have been riding for 52 years now, better make some of the more scenic Minnesota rides before it’s too late!